The Big Bang is the scientific theory that is most consistent with observations of the past and present states of the universe. Come let's try to uncover the mysteries of Universe. 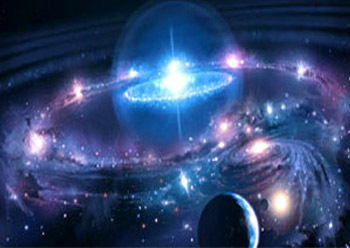 Long long ago, around 13.7 billion years back there happened a moment of creation at time t = 0, known as the Big Bang. It all started with a bang from a singularity which was smaller than a sub&dash;atomic particle that had no dimensions. This glorious moment of “Big Bang” wasn&apos;t any sort of explosion (or bang) as the name suggests, but a swift expansion of space and time. It can be assumed as the air filling a balloon, and the balloon starts to expand. 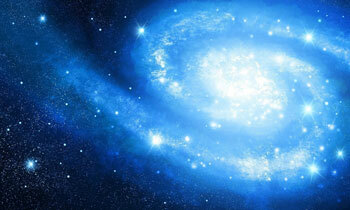 In simple terms, the theory of Big Bang states that as the universe is expanding it could be more denser in the past. Hence in the very beginning it should be a point mass of infinite density. 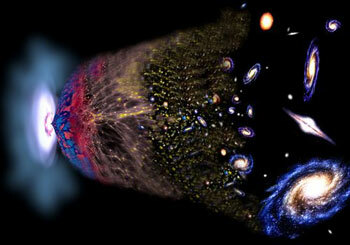 Thus the Big Bang theory explains the birth of our universe and is widely accepted with in the scientific community. Formation of basic elements Only the lightest elements were formed – hydrogen and helium along with trace amounts of lithium and beryllium. An incredible burst of expansion (much faster than speed of light) known as “inflation” started when the universe was just 10−34 of a second or so old (i.e., a hundredth of a billionth of a trillionth of a trillionth of a second!). Later within a single moment the universe got expanded to hundred billion light years. Thus generating heat during expansion which was of the order of ten billion degrees, where elements like hydrogen and helium could be created in a nuclear reaction. According to Guth&apos;s theory, the gravity emerged at one ten–millionth of a trillionth of a second, followed by electromagnetic and nuclear forces. During the very first second itself the universe was filled with neutrons, protons, electrons, anti–electrons, photons and neutrinos. Later in the first three minutes of the universe some of the elements like hydrogen and most of the deuterium (an isotope of hydrogen) combined to make helium and traces of lithium were formed. As the time passed by (which could be about 10,000 years after the Big Bang), the temperatures of the universe reduced to a great extent. The massive particles of the Universe began to dominate the average density of the universe. As the cloud of cosmic dust and gases from the Big Bang cooled, stars formed, and these then grouped together to form galaxies. Thus the gravitational forces between the particles could begin to take effect followed by the formation of galaxies, stars, planets, etc. Formation of galaxy As the cloud of cosmic dust and gases from the Big Bang cooled, stars formed, and these then grouped together to form galaxies. As the time passed by (which could be about 10,000 years after the Big Bang), the temperatures of the universe reduced to a great extent. The massive particles of the Universe began to dominate the average density of the universe. Thus the gravitational forces between the particles could begin to take effect followed by the formation of Galaxies, stars, Planets, etc. The Cosmic Microwave Background radiation is a faint glow of light that fills the universe, falling on Earth from every direction with nearly uniform intensity. A radiation filling the entire universe was detected and is known as the Cosmic Microwave Background (CMB) radiation, which stands as an evidence for the Big Bang. At first CMB was detected by Penzias and Wilson, and was described as an echo of the Big Bang. They were given Nobel prize for this monumental discovery. The echo of the Big Bang is not something related to sound but is the heat signature through out all of space. The universe is expanding at its own pace. Usually the objects in space move away from the Earth with a velocity proportional to their distance from us, which can be observed using a red shift that occurs with the Doppler effect. As per the Copernican Cosmological principle, the universe appears to be same in every direction, when observed from any point in space. This phenomenon is known as homogeneous and isotropic. A mysterious quantity known as dark energy makes up nearly three-fourths of the universe. Yet scientists are unsure not only what it is but how it operates. Another evidence for the Big Bang was provided by Edwin Hubble (1929) when he correlated the distance of objects in the universe with their velocities, using Hubble&apos;s law. Later the theorists of Big Bang used this law to find the age of Universe (14 billion years) which was consistent with the actual age of Universe. The scientists believe that most of the universe is made up of dark energy, which is responsible for the expansion of the universe. Normal matter including galaxies, stars, comets, planets, etc could form only 5% of the universe, whereas 95% of the universe is only filled with dark matter. We can have one more evidence for Big Bang which predicts the abundance of light elements like hydrogen, helium, etc. As per the nucleosynthesis of Big Bang almost a quarter of the universe should be filled with helium–4, which is in good agreement with what was observed. Before the Big Bang there was no space and time which came into existence after it. So we need another theoretical model to explain what was there before Big Bang and what was the cause for the same. Our Milky Way galaxy is one among 100 billion galaxies of the Universe. The truth of the cosmos is a mystery. The past discoveries about the universe cannot lead to any further exploration, as it keeps expanding. 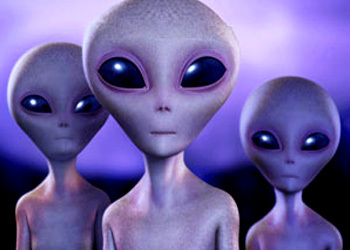 The cause of the universe would be some thing strange beyond our understanding and imagination. Is observable universe infinite? 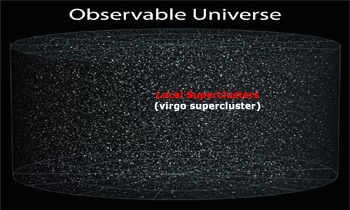 It is no question that the observable universe is big, but how big? Astronomers find themselves lost in a cosmic ocean trying to peer past the purview of an astronomical horizon. The biologist J.B.S Haldene once observed “The Universe is not only queerer than we suppose; it is queerer than we can suppose”. Carl Sagan estimated the probable number of planets in the universe at large to be 10 billion trillion. He further says “If we are randomly inserted into the universe, the chances that you would be on or near a planet would be less than one in a billion trillion trillion”. The visible universe is about million million million million miles across. According to Rees, the universe at large, beyond the visible universe, called meta–universe is nearly infinite. There are hundreds of billions of galaxies beyond our own Milky Way galaxy. These galaxies are so far that it would take millions of light years to reach them. The galaxies that we observe today using advanced telescopes are dated much before there was life on Earth, since the light from them reach the Earth after few billion years. 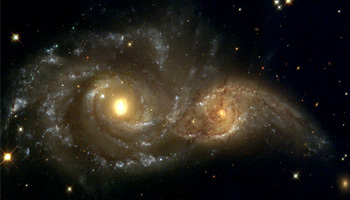 Distance between galaxies Scientists have indirect evidence that the galaxies can extend to infinity. How far apart are galaxies? The wattage of the Pulsating stars can be found by observing the time lapse between each dim and sparkling of a star. This method is used to measure the distances across the Milky Way galaxy. There are tiny galaxies (smudges) which appear to be smaller, even if we use huge telescopes to view them. Astronomers can find out the approximate distance to these galaxies by watching for the supernovae. As the universe consists of dark energy and dark matter, we cannot watch the universe as the light could not reach us since the beginning of the universe. Scientists have indirect evidence that the galaxies can extend to infinity. One could really dwell on the eternal question: Is the Universe infinitely large? Large beyond limit. 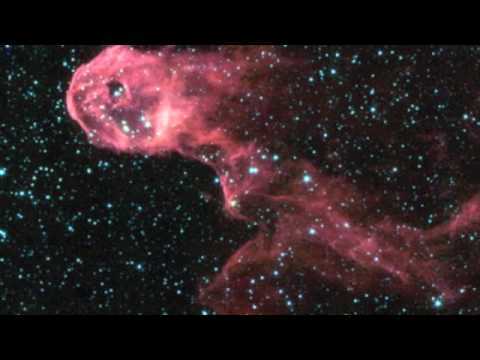 May be the other parts of the universe may look very different when compared to our own. They may also have different laws of nature. So we need to wait for them to be discovered. 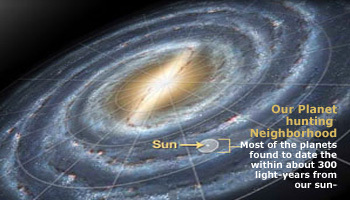 Milky Way galaxy consists of huge stars, planets, comets, etc. It was so big that the speed of light takes 1,00,000 years to travel across it. There are hundreds of billions of stars in the Milky way. The average distance between stars in the milky Way galaxy is 20 million million miles. Scientists found that the the nearest star to us proxima centauri which could be 4.3 light years away. The fundamental distance to scale the entire universe was taken to be the distance between the Sun and the Earth which is 93 million miles. A fastest space shuttle which travels at 8km / sec would be able to reach the nearest star of the Earth (beyond the Sun) in 70,000 years! It’s been over half a century since Frank Drake developed an equation to estimate the probability of finding intelligent life in our galaxy. Frank Drake proposed a probabilistic formula to help estimate the number of active, radio-capable extraterrestrial civilizations in the Milky Way galaxy. Frank Drake, Professor at Cornell tried to estimate the chances of finding advanced life in the cosmos. Drake's equation divides the number of stars in a part of the universe by the number of stars likely to have planets; divide that by number on which life exists and then by planets with life advanced to a state of intelligence like humans and so on. The number could be millions in just the Milky Way itself and hence there is good chance that there are millions of advanced civilizations like ours or even more advanced. However the distance between two civilizations could be at least two hundred light years.